Customer onboarding (i.e., enrollment and move-in): A utility firm’s customer service personnel can benefit tremendously from continuous, real-time insight into the status of all outstanding onboarding requests that are at different stages in the lifecycle. Disconnect/reconnect services:Utility billing operators handle a deluge of events every day that are related to disconnect and reconnects for people who have exceeded the allocated payment period. Thousands of enrollments and disconnect/reconnect service requests can be open at any one time, and each can have hundreds of business events associated with it. Real-time insight into these events is critical. To add to this complexity, these firms use numerous applications to support the onboarding and disconnect/reconnect processes, such as CRM, billing, invoicing, payments, and collections systems, and an electronic data interchange (EDI) system for sending and receiving transactions. Furthermore, each system typically has its own reporting module. Although metrics and exceptions for some systems might be seen by people in different departments, there is no end-to-end view. As a result, management reports do not cross application silos and do not cover metrics of interest to the business. Thus, operational business units charged with monitoring these processes have no centralized way of finding where a particular customer’s enrollment is in the process lifecycle. Sometimes, if a customer’s enrollment is stalled, the energy utility may only learn of the problem when the customer calls in to complain. Vitria OI provides a fresh, new approach to continuously monitoring real-time customer billing and provisioning processes. It empowers energy utility operators to quickly act on insights gleaned from streaming data by enabling them to monitor end-to-end activity across these critical business processes. Operational managers can easily track-and-trace operational activity across applications and systems, in real-time, and then take immediate action on the uncovered insights – a task that is almost impossible with siloed monitoring systems. With Vitria OI, energy and utilities firms can save significant costs and improve customer satisfaction by accurately revealing patterns or problems even before the causes are clear. Vitria OI enables the creation of end-to-end process tracking process models that visualize the flow of work across systems. It then captures business events at runtime from the supporting operational systems using its streaming analytics engine. Vitria OI then presents live, role-based dashboards and problem resolution processes that incorporate business rules that represent regulations, SLAs, as well as internal corporate policies. Dashboards display relevant information at both the individual process instance level and in an aggregated view. Vitria OI uses its internal streaming analytics engine to find meaningful patterns from business events that represent exceptions or other situations of interest that can then trigger alerts or corrective processes. The streaming analytics engine enriches events by inserting account/transaction identifiers to match business events with customer service requests. 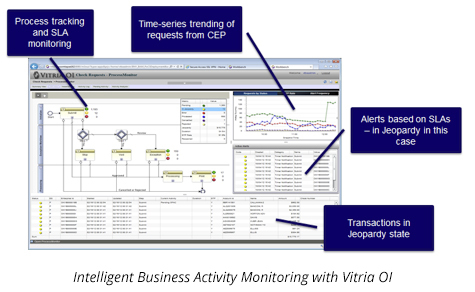 With this contextual information, Vitria OI can provide real-time information to help determine why a service request did not proceed within the expected time. For example, the customer service representative who entered the service request might have used an invalid code to enroll a customer, so the transaction did not advance to the next step in the process. Vitria OI can detect this situation and send an alert and, if it is a high-priority customer, Vitria OI can also send an email notification to the appropriate manager to resolve the problem.